At the end of November, Remodelista featured the Filigrantrae, a Danish wooden Christmas tree that can be used year after year. I was taken, but the marthaandtom production budget didn’t exactly have $275 floating around with which to fulfill all our Scandinavian holiday fantasies. Almost immediately after seeing the images on Remodelista and then Design Public, a little idea floated into my head… I could make this myself. A typical I-could-make-that feeling turns into “I could make it, I just didn’t” …but not this time. With the aid of a math problem made Facebook status, I developed a plan, helped along by Emma’s Designblogg‘s sharing of a series of photographs originally from Bolig Magazine of a Danish family’s home with one of these babies in every room (at $275, you bet they come in multiple colors: rødt, lime, sort, hvidt, and lilla). This was the final inspiration I needed. With only hours left before snow would seal us in our apartment for the foreseeable future, we made a mad dash for Home Depot on Friday night. While everyone else was stocking up on snowblowers and shovels, Tom and I were shopping lumber. At $26.86 before tax — power-sawing included — we were off to a good start. As of yesterday evening, we now have a fully-decorated tree that can be used again and again. Before you head to your local lumberyard to buy out their dowel supply, I would share that this wasn’t as easy as I thought it would be. I have a renewed understanding of what it means to have the right tools for the job and a steadier hand with a drill. With all of the mistakes that went into this one, I was very tempted yesterday to throw out the central pole and begin again (I bought different drill bits midway through the project almost doubling the total cost. But at less than $50, I’m still not complaining). While it’s not perfect, I’m taking the suggestion of my father (who I must thank for his willing participation in a video-chat planning session on Saturday) and living with all the character of this first attempt. With no further work in store, I finished just in time for my self-imposed deadline of December 15, the night before my family’s tradition of reading the Novena de Aguinaldo is to begin. 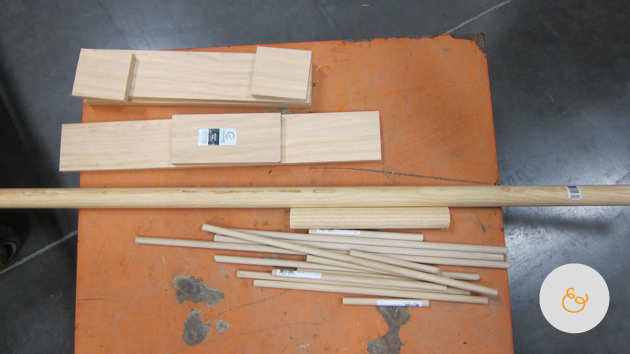 Don’t forget wood scraps for practice if you’re less-than-handy with your drill. I bought a 1′ section of a closet pole in addition to the 5′ central pole of the tree to practice making ½” holes and kept the extras from the 1×4 to prevent my drill from going through our living room floor. All measurements included are approximations based on studying pictures and descriptions of the original Danish design. If you plan to make your own, don’t worry about sticking too carefully to the exact specifications listed here. Note also that the original design uses birch, which is no doubt much easier to obtain in northern Europe than in a big box wood retailer in the midwestern United States, where pine is widely available for a very low cost. *My plan called for 1×4″, 3×6″, 2×10″, 2×16″, 3×20″, 1×18″, 1×26″. ** The original design has an angled cut at the top… I forgot to request this of the staff at Home Depot. This is probably best done with a handsaw at home, though. ***Using drill bits not made specifically for wood working may result in much less than perfect drilling. For best results, DO NOT use a flat bit, even if it is specified for use on wood. I used this brand and was able to buy a single ½” bit at the hardware store. For help getting to know your drill, click over to Design*Sponge’s new feature on building your toolbox. This entry was posted by Martha on Monday, December 13th, 2010 at 5:17 pm and is filed under Apartment. You can subscribe to responses to this entry via RSS. Sweet! I love it! That is awesome, and you might have to make me a mini one. 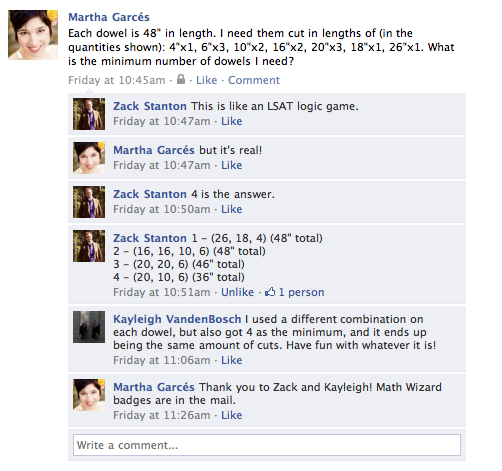 Beautiful, Martha. The pictures are great too. You are so talented! This is lovely! 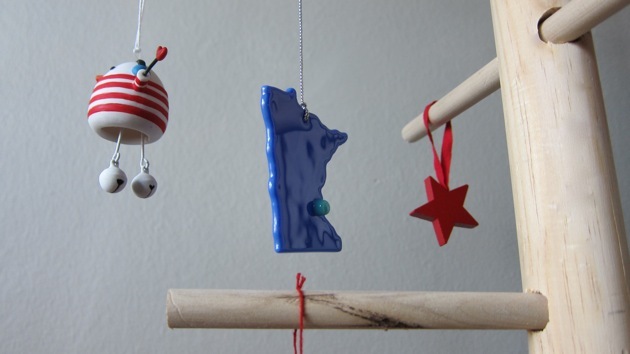 I’m also curious where that adorable blue MN ornament came from. Festivus is right round the corner! Thanks for chiming in, Merry! I hope you can find one soon, Delaney. Martha–that turned out beautifully! I love the simple, clean colors. what a treasure for years to come, adding to it each year. Definitely an educating project! Thank you for doing all of the hard work, Martha!! You’ve made the entire project much much much easier for the rest of us. Sara… If folks want to buy a Filigrantrae, I’d encourage them to buy one from the original manufacturer (available at Design Public in the US, as noted above). My husband and I made a tree following your specifications in four short hours today (including Home Depot and a visit with friends to use their drill). This is our first Christmas tree and we couldn’t be more proud of it! He wants to stain it tomorrow but I already have each ornament in place. 1. Jessica: Thanks for sharing your success! I’m glad to hear you were able to create a similar tree using my “ingredient” list. Feel free to email a picture, we’d love to see it. 2. Note: For the next time I make a tree (or the next time I drill through any piece of wood) I’ll be reminding myself of Benita @ Chez Larsson’s tips on drilling here. 3. 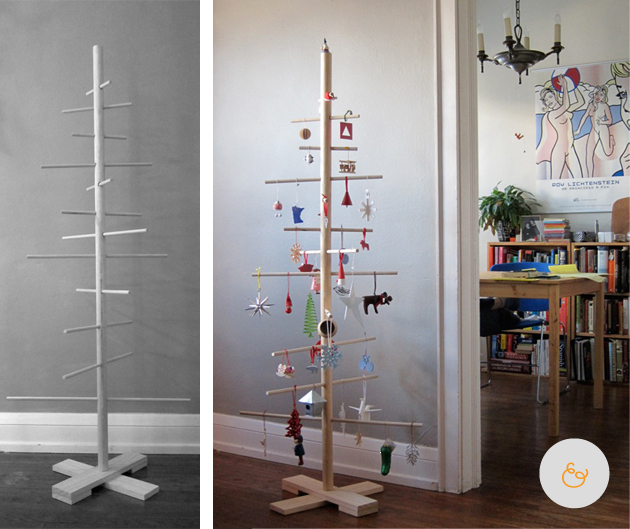 Update: Apartment Therapy’s 2011 “10 DIY Modern Holiday Alternatives” feature our tree. Thank you for sharing this. We have a family member that is planning to visit us over the holidays who is allergic to live trees. We didn’t want to buy a traditional fake tree and we were pondering what to do. This is a fantastic alternative. LOVE this idea! I plan on making it for this Christmas! I can’t wait to get started. I have one question – how far are the dowels spaced on the tree? The dowels are intentionally unevenly spaced on our tree. The distance between the holes in the central pole ranges from around 4-6 inches, I’d say. I just finished my tree, thanks to your specifications. I am so friggin’ excited I want to post a picture before I even decorate it! Thank you so much! Congrats, Helen! The tree I made in 2010 was victim of a flood in our storage area this summer, so I ended up referring back to my plans here to make a new one last month. I’m glad to hear they were of use to you too. My mother had a flat version of this that is table top size and would decorate it for Easter, Christmas and Valentine’s Day. I found one like that at an estate sale this fall and couldn’t resist picking it up! I am just using it as a decoration item all its own, though… without any little ornaments sitting on it. It looks very home-made.